As the Fed continues to be “transparent”, markets are left roiled in the wake. First, we had the fiasco on May 22nd and now we have this week. Comments from Chairman Bernanke during yesterday’s testimony caused an afternoon selloff that strengthened into the close. 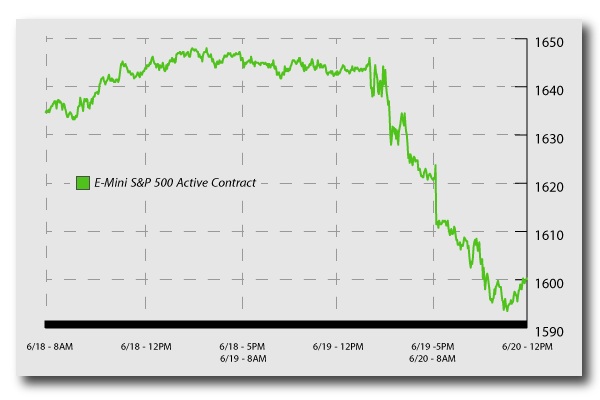 Not surprisingly, the selling pressure continued through today’s open with a gap down at the opening bell. The current quantitative easing program is an experiment and like all experiments, the impact and results are unknown. Before the word “tapering” became headline print, no one knew how financial markets would react when the Fed moved away from a one direction approach (i.e. increasing QE). 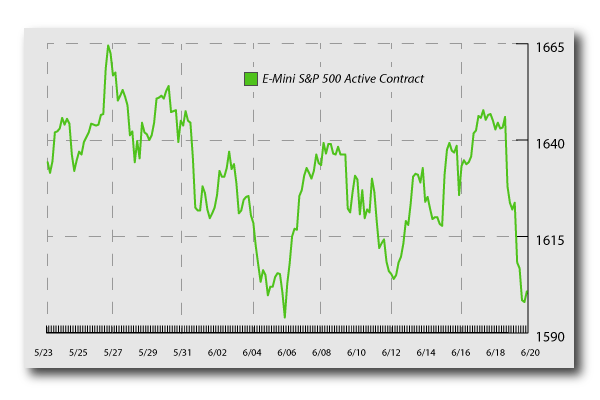 With a few small suggestions of turning back the dial later this year or early next year, equity and income markets turned into roller coasters. The global economy is addicted to central bank easing. We all know this fact. Central bankers and governments are falling over each other trying to find a way to spur growth. What we did not know and quickly found out was what happens when the junkie finds out there is limited supply of the fix. Fixed income and other interest rate sensitive asset classes have become the risk in portfolios.Equities, while volatile lately, are more or less range bound. Since early May through this morning, the S&P 500 Index has traded within the 1600-1686 channel. From a median level, the high and low are only a difference of 2.5% each way. In the fixed income world, the trade has been much more linear (and at times near parabolic). In the same period, the yield on the 10 Yr Treasury rocketed from 1.63% to 2.4% with little stopping along the way. All along the way, income portfolios have been crushed (yields and prices have an inverse relationship). While the Fed tries to give clarity on its plans, it seems to be leading to more confusion and chaos than they are trying to prevent. The problem is the Fed is now multi-directional: it can increase QE, hold stready, decrease, wind down purchases, or shut it off completely. Additionally, Fed officials are in disagreement on QE policy. The Fed is now too transparent I would argue. The health of our economy depends on the health of our financial markets. Consumer confidence is at the level it is due in part to consumers seeing investment portfolios appreciate. That confidence has translated into demand for goods which has kept GDP afloat. If the Fed injects volatility into the market along with liquidity, we could see the fragile system start to break down. Strap in tight, this coaster is long and the drops may not always follow predictable climbs.